Without Spending A Dime On A Graphic Designer! 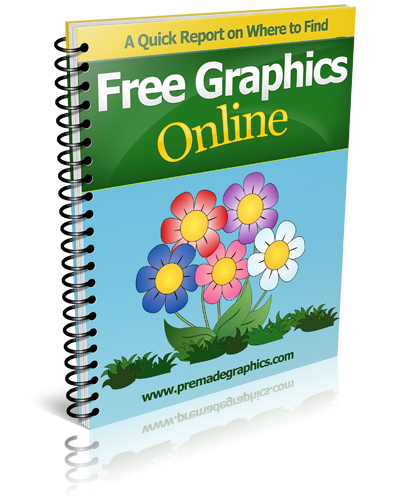 Save Thousands of Money On Graphic Designers & Quickly Create Your Own Graphics! Instant Graphics Design Collections. Easy to Use When Needed. Increase Your Product Sales and Page Conversions in just a short period of time. Photoshop Not Required! Edit Your Graphics Using Free Editors. Download DIY Graphic Designs Now! Why Should I Use DIY Graphic Designs? Use these ready made graphic design templates to attract more attention, retain traffic and eventually make more sales. Never waste thousands of money again on another graphics design. Using ready made templates is the smart way. No more unnecessary delays, waiting or endless revisions. Be the boss of your own business! Use Powerpoint or Open Office to edit an element. You don't have to use Photoshop or any other expensive software. How To Use These Ready Made Graphics? Here are a few excellent tips how you could take advantage of these pre made graphics to save time, money and boost your sales! It's true, you don't have to be a "graphics professional" or a "technical genius" to design them either! Attract thousands of Facebook likes for your page and acquire a massive following, which means, free traffic and instant credibility and increased sales! Start taking advantage of highly optimized and mobile friendly capture pages to rapidly increase sales conversions, grow your own list, and create a steady, reliable internet income! Quickly design a high quality, professional ecover designs for your next best-selling info product. Simply copy & paste private collection of conversion boosting designs to increase your sales. Take advantage of the newest trend in design without having to code a single line! Immediately use one of our top quality minisite graphics and templates that are proven to draw more sales and conversions. Using mascot graphics is a modern and excellent marketing tool that will help you stand out from thousands of competitors. It enhances your sales pages so you can get more attention, improve sales and make more money online! Ever wanted to boost your conversions? Ever dreamed of redesigning your primitive-looking sites into sales monsters? Save Thousands of Money and Yet Get the Best Graphics Designs, Stop Waiting For Days or Weeks Just For a Project to be Delivered, and Simply Take Full Control of Your Business! But it gets worse. Even though design prices seem to increase every time, finding the "perfect" graphic design can be a real challenge. Now, It's Time to Design Your Own High Converting Graphics... Do it Less Than 5 Minutes, With Absolutely No Photoshop Skills Required! You can save thousands of your hard-earned money by taking advantage of ready made graphics design templates. Smart online and offline marketers are saving tons of cash by making use of ready-made graphic design templates. They know they don't have to waste money on expensive graphic designers. Any time they need graphics for their projects, they just use the ready-made templates. No more waiting for designers. They can deploy faster and they have full control over their business! And now you can do the SAME... for the FRACTION of the price that others pay! Imagine Swiping My "Hand Picked" Collection Of Premium Quality, Conversion Boosting, Done-For-You Graphic Templates That Will Transform You Into A Superstar In Your Own Niche! Let me unveil to you my highly-guarded, giant collection of ready-to-use graphics and pre-designed templates worth thousands of dollars! Most of these premade graphics templates are very new which guarantees 100% freshness and 100% uniqueness. Be assured that this will help you quickly brand yourself uniquely and get ahead of the pack! Presenting... "DIY Graphic Designs - Alpha Vault"
Each graphic was designed with extreme care to create a feeling of professionalism, credibility and trust. This will convince your prospects to buy what you're selling. This graphics package is designed with online marketers in mind. Great for busy website owners and affiliate marketers who are promoting products using graphics. Whenever you need a graphic template for your project, it'll only take seconds to find exactly what you need. Next, just make some customizations and your ready to go! It's that simple. Get Access To DIY Graphic Designs! Unique From Any Other Design Packs? 99.9% Unique, Brand-New Graphics - Most of the designs were created lately and are completely NEW. Renew your site's look and feel with these instant, high-quality graphic templates now! No Photoshop Required - These ready made graphics are quick and easy to edit and won't require Photoshop. In fact, many of the templates don't need editing and can be used right away. Comes With Full Developer's License - Design high-quality graphics for your own clients for quick income. Create high-class, high-converting sales pages, web banners as well as video backgrounds that will surely impress your clients! Based On The Latest Design Trends - All the templates are based on the latest fancy trends so be assured that your site always looks new, modern and highly appealing! That means your customer will respect you more and be willing to send you more money! Convinced? Well, This Is Just The Tip Of The Iceberg! I'm confident that after inspecting the contents of this awesome, uniquely designed premade graphics templates you now appreciate the enormous value that this package has. Completely FREE But Only If You Act Now! Revealed inside this short report are not so popular places on the internet where you can find free but high quality royatly free images, patterns/textures, vector graphics, icons, backgrounds, fonts, and many more! This package is a big collection of over 400 website icons that you can use to enhance your blog, website, landing page, and sales pages. It comes with the newest and high quality feature icons and designs you haven't use yet. All icons comes in .CHS format (Photoshop Custom Shape), PSD format, and PNG for easy editing and usage. 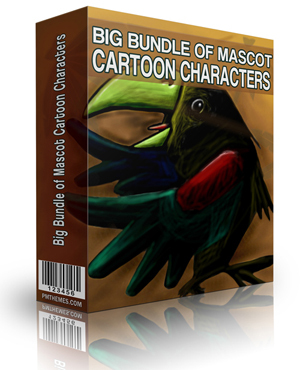 You'll get over 20 sets and 200 different niche mascot characters - all designed and created by professionals! Upgrade your old-looking banners with modern and prefessionally designed web banners. You'll get 30 sets of ready made web banners templates in PSD (Photoshop) format. 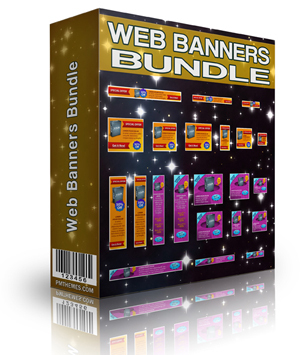 Each contains up to 12 different banner sizes. Banner sizes includes: 120x240px, 120x600px, 125x125px, 160x600px, 180x150px, 200x200px, 234x60px, 250x250px, 300x250px, 336x280px, 468x60px, and 728x90px. This is a huge collection of ready made background graphics that you can use for your website, PowerPoint slides, and video presentations. Have you ever tried to create a logo for your website or for a client? If so, then you know how hard it can be! Now you can get 300 high quality logo templates in Photoshop format (PSD). Also included are .rdw formats (Real-Draw). 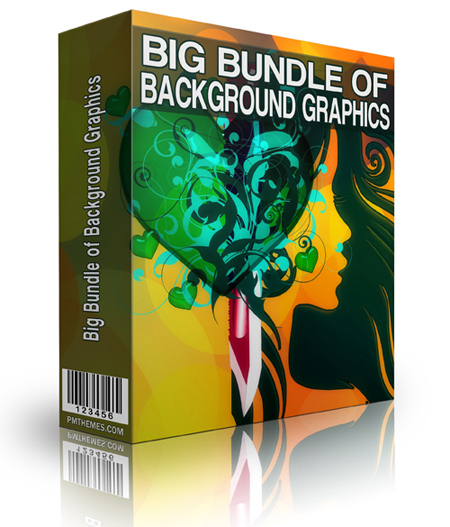 Absolutely free when you buy this DIY Graphic Design Package. Get over 250 very cool infographics that you can use for your marketing efforts! This new set of ready-made infographics template comes in PSD and PNG format for easy editing and usage. With this graphics, you can enhance not just your creativity but also your Facebook and Twitter followers and eventually your profit. If you're new to working with graphics, you can watch included video tutorials on how to quickly edit and customize these graphic templates. Within minutes you be able to do some changes and make a particular design template completely unique. It's going to be a lot of fun using Photoshop! NOTE: If you don't have Photoshop, you can edit most of the graphics by using a free online graphic editor called Pixlr.com. For each graphic inside DIY Graphic Designs package, an additional "No Photoshop" version is included so that you will be able to edit it on Pixlr. Additional video tutorial on how to customize your graphics in Pixlr is also provided. The fact is, it's totally worth such a price. Think about outsourcing just 100 unique sales page graphics. For $14 a pop that's $1,400 right here! Well, you may opt to design the graphics all by yourself and spend days or even weeks simply trying to learn how to use Photoshop. It's your call. 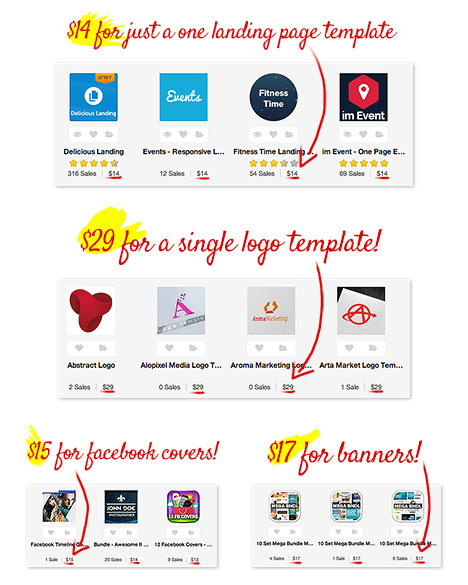 The other option is to buy expensive, commonly used graphic templates from marketplaces like graphicriver.net. But be ready to shell out more money than what you are willing to spend. Before revealing to you the final price, let's sum it up together. 2,272+ graphic templates could easily cost you more than $1,000 in the graphics market. Yet you won't need to pay that much! Not even $200 or even $97... Not $67 either. and Get Full Access Right Now! So here's the deal: your total investment today will not be $67.00, although that should be the regular price. Yes, you read it right. For just $19.95 you are granted full access to this awesome collection of the latest and high quality graphics design templates including all the bonuses! That's a crazy bargain! A whooping 70% discount. Just think about it for a second. You'll get a lifetime, unlimited access to 2,272+ stellar-quality graphic templates for less than $0.027 EACH! Here are the main reasons why I'm charging only $19.95 for this premium package. $19.95 is a price most people can afford. With that, I'm able to capture a wider market and get more customers. In the future, I'll then be able to offer them more high quality graphics products and eventually expand my business. I want every individual to have the opportunity to try my proven conversion boosting graphics. I love seeing people go from ZERO to amazing success, and I want the same for you too! If you still can't wrap your head around this expense, skip getting a coffee at Starbucks once this week and it's paid for. Try "DIY Graphic Designs" risk free for 60 Days and if for some reason you are not totally satisfied with these awesome graphic products, feel free to contact us using our Contact Form and I'll gladly refund your money with no questions asked, no hassle! If you actually used these graphic templates on your projects and you won't notice any significant changes, feel free to contact me and I'll refund all your money. 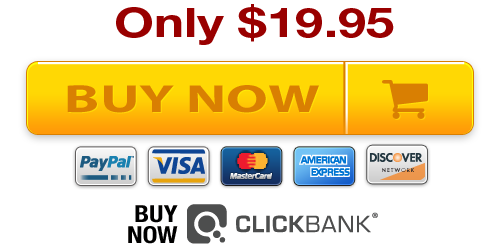 Verified and Secure Checkout via Clickbank*. Many of the graphics do not require Photoshop. There's a separate folder for No-Photoshop version which you can open using a free online graphic editor like Pixlr.com. With this free tool you'll be able to edit your templates quickly and easily. 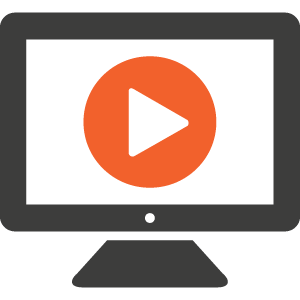 There's also a super simple video training that show you how to edit the templates! Many designs are also "plug-and-play" templates. That means, you can just copy and paste on your site! How Do I Access My Products After Purchase? Immediately after payment, you will be given a special link to finish your registration and setup your username and password. As soon as that is completed you will be able to login and download all products promised in this page including bonuses and product updates. It was set this way so that you can always return and redownload everything. No more worries about losing your graphics just in case there's a computer crash. Do You Own A Full License To All The Templates? Yes! I have the full rights to all the graphics listed here. For images, we only used royalty free images from free resources which allows us to include in this pack. Does It Work On Mac/Windows? Yes, the graphics work on both Mac and Windows. Can These Templates Be Used In Wordpress/OptimizePress/LeadPages? Yes, you can use these graphics anywhere. For Wordpress, simply use the upload option. No. This is a one time payment only. No hidden cost. No Sales B.S. Access all graphics for lifetime. YES, absolutely! Once you get your package you'll receive a tutorial video where you'll learn how to edit the templates. You can always contact me for help, just send me a message and I'll answer any issues within 24 to 48 hours. Does It Come With Developer's License? YES, it comes with a developer's license. Feel free to use it on unlimited projects of your own or on clients projects. P.S. Keep in mind that we are taking on all the risk with our 60-day no questions ask, no hassle money back guarantee. You see, I'm 100% confident that you will really like and use what you receive when you buy the "DIY Graphic Designs - Alpha Vault"... You have nothing to lose and all kinds of profits to gain! Get "DIY Graphic Designs - Alpha Vault" Risk-Free! P.P.S. Think for a moment how much time and money you will be able to save with this beautiful sets of graphics. No more wasted time trying to find the right graphic designers and no more waiting for weeks. Finally, you will be able build professional grade websites, create your own client-attracting porftfolio, or turn your old and dull-looking design projects into high-quality work that demands respect from your colleagues as well as competitors. YES! I Want To Turn My Website Into (Beautiful) Money Machines! Get Access To DIY Graphic Designs Now! All Rights Reserved. DIY Graphic Designs 2016. Members Page - Affiliates Make Money!